At a December 1856 meeting, the farmers of North Hadley, Mass., approved the proposal that “the interest of Agriculture would be materially promoted by the formation of a farmers club.” Drafting a constitution, they elected Lewis Fish President, Joseph H. Shattuck Vice President, and Levi Stockbridge (a key figure in the early history of the Massachusetts Agricultural College) Secretary, and for several years thereafter, they met regularly to pursue their mission of elevating farming through education and the application of scientific principals to agriculture. The club appears to have folded during the later years of the Civil War. The minute book contains a relatively detailed record of the meetings of a typical late-antebellum farmers’ society in New England. Typically held during the slower seasons, the meetings centered around discussions of new methods for improving the profitability of farming, from proper plowing to manuring, breeding, marketing, and the various “experiments they have tried” on their farms, but some discussions ran into debates over the morality of tobacco farming or general ideas for improving the social image and status of farming. The minute book includes relatively detailed synopses of each meeting, with the entries prior to 1861 tending to be a bit more extensive. Born in Newport, Rhode Island in 1919, Alford S. Peckham attended Rhode Island College, graduating in 1941, before serving in the U.S. Army 1st Division until receiving a medical discharge. For twenty-one years he worked as the manager of public relations for the United Farmers of New England, a cooperative of dairy farmers. His interest and expertise in agricultural history continued even after he left the cooperative for the Federal Reserve Bank in Boston; he was appointed the Massachusetts state agricultural historian in July 1989 and amassed his own collection of historical resources in the hopes of developing a Massachusetts Agricultural History Society. Peckham died on December 20, 2005 in Newport, Rhode Island, his home since his retirement in 1984. Consisting chiefly of subject files, the Alford S. Peckham Collection covers topics ranging from agricultural history and fairs to dairy farmers and animal rights. 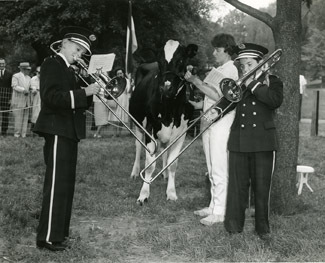 Also included are photographs of agricultural events around New England, such as the Massachusetts Dairy Festival (1958), the American Dairy Princess (1961), and the Big E (1950s). A prosperous farmer in the southern reaches of Massachusetts Bay Colony, James Richards was born on June 2, 1658, and never ventured far from his from his home in Weymouth or the adjoining town of Braintree. The son of William Richards and his wife Grace Shaw, and a member of the third generation of Richards in the new world, James was characteristically diverse in his economic activities, raising livestock (sheep and pigs), harvesting salt grass, making salt, and raising crops including rye, corn, and barley, which he malted, presumably for the production of beer. Although most of his transactions were local, he traded as far away as Charlestown and Barnstable. The Richards family ledgers include a daybook from James Richards kept between 1692-1710 and an account book from his great grandson Jacob Richards kept a century later, along with loose receipts from generations of Richards in between. The volume associated with James Richards records sales of goods produced on his Weymouth farm, including barley, rye, “Indian corn,” salt, mutton and lamb, pork, and eggs, along with occasional records of the sale of goods such as shingles, “board nails,” clapboards, molasses and sugar, lamp oil, tobacco, and cloth. The sparser records from Jacob Richards include accounts that include the sale of cider; cord wood; pine, oak, and maple boards; and shoes. Gift of Carolyn Taylor, June 2017, through the UMass Press. Feeling the frustrations of millions of women and girls in rural America who lacked the support or resources necessary to combat unemployment, inadequate medical care, and domestic violence, Jane Threatt along with several other women decided to form a non-profit organization that would unite these women and give them a national voice. Established in 1978, Rural American Women (RAW) was organized to promote the interests of rural women in the areas of equal rights, employment, education, family life, and freedom of all forms of discrimination. In 1981 RAW held a series of five regional conferences throughout the country, and the bulk of this collection consists of records relating to the New England meeting. The records also include some materials documenting the group’s activities at their national headquarters in D.C., such as minutes, correspondence, newsletters, and pamphlets. Prosperous, slave-owning farmer from Amesbury, Massachusetts, who also served as town warden, selectman, and representative. Includes details of the purchases of agricultural products (corn, potatoes, lamb, rye, hay, molasses, wood, cheese), and related services with some of the town’s earliest settlers, widow’s expenses, expenses in support of his grandmother, and family dates. Gilbert Smith was a shoemaker and doctor from New Marlborough, Massachusetts, and his son Gilbert Jr. was a prosperous farmer from Sheffield, Massachusetts. Includes merchandise sales, labor accounts, lists of boarders, and documentation of the sale of homemade butter and cheese to local merchants, as well as trade with the substantial rural black community of the region. Born in Williamstown, Massachusetts, in about 1810, Nelson Smith was about thirty when he married Sallena Burnett of Granby. When Burnett’s father Bela died in 1846, Smith inherited the family farm of 125 acres, now situated on Burnett Street, where he and Sallena raised a family of at least six children. Nelson died in 1892 at the age of 81. This slender book of accounts includes records of Smith’s financial transactions at a time in the 1830s when he was living in South Hadley, Mass. These include entries for rent, records of hiring out for work at a dairying, at Josiah W. Goodman’s brickyard (at a salary of $32 per month), or for unspecified labor. Other entries record the sale of tallow, cider, cordwood, rye, turnips, and other commodities.